Shazam! is a breath of fresh air in the cluttered comic genre. The film is a buoyant celebration of childhood fantasy. Mixed with heaping spoonfuls of heart, humor, and adventure. We've become so accustomed to thematically dark storylines. Shazam! reminds us how much fun being a superhero can be, and the awesome responsibilities that come with it. Adults and kids alike are going to be smiling from ear to ear leaving the theater. Shazam! has several time frames, but the majority of the plot takes place in modern day Philadelphia. Billy Batson (Asher Angel) is a fourteen-year-old orphan with a history of running away from foster homes. He's obsessed with finding his birth mother. After another incident with the cops, the state places him in the loving care of Victor (Cooper Andrews) and Rosa (Marta Milans) Vasquez. Products of the system themselves, they foster a diverse brood of five abandoned children. Billy shares a room with the handicapped, superhero obsessed Freddy (Jack Dylan Grazer). Even though he finds Freddy annoying, Billy defends him from a pair of school bullies. When they give chase, his subway escape turns surreal. Billy is magically transported to a mysterious cave. Where he is confronted by an ancient wizard (Djimon Hounsou). Billy has been deemed worthy of his sacred powers. When he speaks the wizard's name, Billy is transformed into a red-suited, adult superhero (Zachary Levi) with a lightning emblazoned insignia. As Billy and Freddy revel in the powers of Shazam!, they are unaware that a previous candidate (Mark Strong) seeks revenge. Imagine being a poor, forlorn teen who gets the ability to turn into an adult superhero at will. Director David F. Sandberg (Annabelle: Creation) and screenwriter Henry Gayden nail the adolescent hijinks. Billy and Freddy have a field day with the newfound powers. These scenes are absolutely hilarious. They are like kids in the candy store, until the tummy ache sets in. Their shenanigans do have consequences. Billy learns that incredible power must be used wisely, not just to charge cell phones and make social media videos. His hero's journey comes with a dose of maturity. It's an uplifting transformation played brilliantly by Asher Angel and Zachary Levi. The strongest aspect of the film is the focus on family. 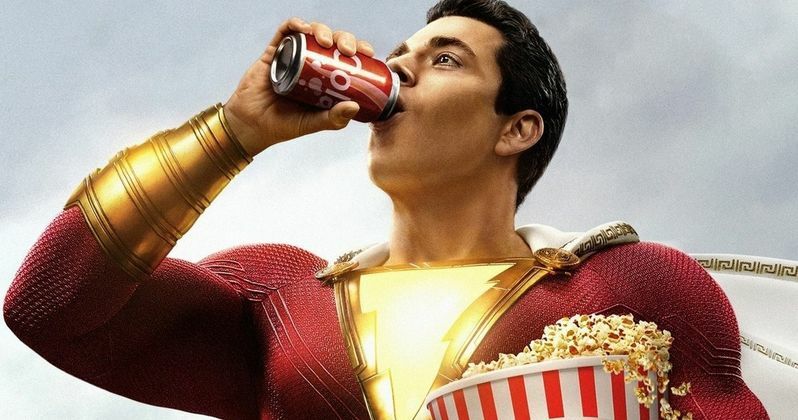 Shazam!, at its core, is the story of an orphan who finds love and acceptance. Billy is a troubled teen who's unconditionally accepted by the Vasquez family. They provide the foundation for him to achieve greatness. This sounds sappy as hell, but is done quite cleverly. Shazam! never devolves into melodrama. It's crisp and entertaining with a whole lot of heart along the way. Shazam! is not going to blow you away with special effects and epic fight scenes. There's action a plenty, but it fits in the context of the story. The battles between Zachary Levi and Mark Strong are CGI heavy, but equally funny and thrilling. Shazam! keeps a humorous tone to the fisticuffs. This lighthearted approach means the duels are the least savage in the DC extended universe. There's no Zack Snyder neck snapping here. That's a Man of Steel reference for you neophytes. Shazam! is a guaranteed crowd pleaser. It's an immensely entertaining origin story, the most family friendly DC film yet. Zachary Levi was an inspired casting choice. His boyish charisma adds such believability to Shazam!. Warner Bros. shakes off the dreariness that has plagued the DCEU. There are two additional scenes during the credits.